I noticed it. I lost my focus for just a handful of seconds. I don’t know why I did, but I did. Everyone round the circle was held in rapt attention by the person speaking. Ok, truth be told, it’s not like I hadn’t noticed before. Karla has brought it to my attention more times than I could count. She points it out because it is annoying. She used to be nice about it. But too many years have elapsed, so now she gruffly says something like, “Stop! Stop shaking the table!” as she repositions herself away from me. Even my kids have joined in the family chant. Not long ago I was driving Mary and Zion to something. While sitting at a light, Zion pipes up from the back row, “Dad, stop! You’re shaking the whole car!” So I am well aware of my irksome tendency. Ok, back to the circle and the thing noticed. What strikes me in the moment is my legs are flapping like a flag in a windstorm storm. But It’s not that only. What I notice in this moment is not so much me, but them. For the first time I notice I’m the only one round the circle whose legs are shaking. I’m conscious no one else is sprinting in place. Evidently, no one else experiences the energy coursing through their body that’s coursing through mine, an energy venting through my extremities. Why do my legs thresh? Because of the throbbing ache when they are still. The energy coursing through my body cannot be contained. My body knows what it must do to compensate for the discomfort. My legs shake because they have to. Again why are my legs shaking? You’ve no doubt heard of Restless Leg Syndrome (RLS); it’s a real neurological condition. I tried to see someone about it, but their next appoint wasn’t for 9 months. Do I have RLS? I don’t yet know. My legs are restless that much I do know. I also know t’s a pain, and that, in both senses. It’s a pain, first, because it hurts. My body is fatigued. Wagging your legs all day leaves them wearied and sore, but with little relief. And when I climb into bed the motion ceases but the ache doesn’t. On the other hand, it’s also a pain because it affects the people around you. Because it’s isolating. Because it’s frustrating. Because it’s embarrassing. What does it mean, this continual motion? As you may have noticed my website and blog were on an extended hiatus. There are a number of reasons for that, but. it’s back now and it’s new and improved. I want to share again what this whole thing is about. I’m excited to be writing again. So much good comes from it for me and I pray for you. Please check it out. One of the changes I made to the site was to reconnect, but really to reconceive, my purpose for this venue. I will be posting about once a week and promoting the blog post mainly through my network on Facebook. If you read something that stirs you or to which you relate, I hope you will re-share it so others in your network can benefit. This is the new website description. I write stories, vignettes really. I write them because they open my heart. I write them because they invite me to make sense of my life. And I write them because they slow down my frenetic pace and reconnect me to myself. I also reflect on things that catch my interest: funny things and emotionally painful things in every case though, it’s something real, honest, true. I don’t want to be disconnected anymore. For too long I been been, from myself, from others, from God. I want to have an open heart to the whole of real life – the traumatic, the mundane, the hilarious. I want an open heart to receive God’s redemption here and now. I have found, though, an open heart is extremely elusive. It’s darn near impossible in fact unless you are really intentional. There are so many obstacles; so much harm. So much regret. So much shame. So much accusation and self-contempt. So little time. So without apology this online avenue is first for me. I need to tell myself vulnerable, honest, and hard stories. I need to slow down enough to pay attention and attune to what is around me. I need to be present. But I write stories and reflect on things for you also. I hope you will read them. I hope that in reading them you too will courageously venture to tell your own stories and to be present. It’s life changing but its hard work. I pray we experience an open heart in the middle of our life story. You’ll find me a www.joelwillitts.com. These Hands Were Made For Build'n! I never think about my hands until I do. I notice my hands more in the late fall and winter than any other time of the year. That’s why I’m writing this post in November and not in June; this is for one very good reason: they hurt! Over the last several fall-winters I’ve been forced to notice my hands. My hands tell a story. Actually, my hands tell many stories. Through the creases of wrinkles over my fingers and the leathery skin of my hands I can trace a history. I agree with one thing the fortune teller believes, if you know you’re hands you’ll know your past and your future. 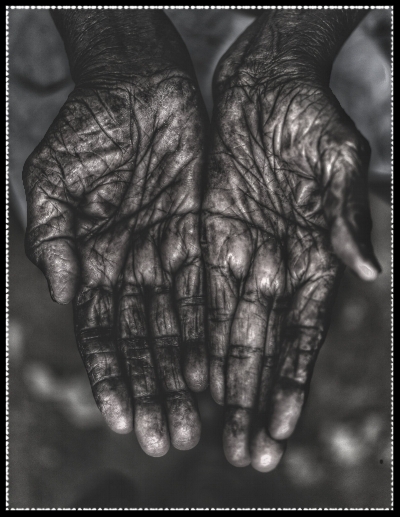 The hands tell the depth and breadth of stories your body knows. And the “plain meaning” of my hands are their age. You can’t hid your age in you hands, though there is a cottage industry attempting to discover how. On my hands, I see the age of my body. These hands, which I barely ever am conscious of until I am, reflect that I’m not a 16-year old, a 26-year old or even a 36-year old. These hands don’t lie about my 46 years. I have the hands of a nearly 50-year old. My hands witness to a life of a near half-century. But if I do say so myself, I’ve got good hands. They are masculine. My fingers are not stumpy or thick. They are lean and they are rugged. If only my whole body looked as good as my hands! None of my fingers point in uncomfortably odd directions since I’ve never broken a bone. My hands have held up pretty well I would say. And even though I spend most of my time typing with my hands or waving them around in a lecture, they look like they have held a shovel, swung a hammer, dug a fence. My hands are the hands of a man. They are the hands of my father. Some years ago, and this was probably a decade ago, I was with my dad, which doesn’t happen much at all. Truth be told I could nearly count out the number of times I've been with my father as an adult on one hand. It was one of those rare occasions when I noticed his hands. Actually I was taken by his hands. Its slightly embarrassing to admit such a thing. Although we have so little in common, he and I, what I realized then was we have the same hands. This realization was both immensely comforting and also startling. It was comfortable because I’m so rarely conscious of being a "son," that I feel much like an orphan much of the time. I see my mom yearly, but it’s not the same. As Robert E. Willitts' biological son, my hands resemble his; and in the presence of his hands, I felt I had a history beyond myself; I felt like a descendant of someone. At the sight of his similar hands, for a moment, I didn’t feel so isolated and alone. Why startling? Because, honestly, I don’t want to be like him in any way. Our similarly looking hands took be by surprise because I felt like his son. I don't like that feeling. My father left me when I was a boy and basically that was that. While there are always circumstances, the fact is when he left, he left. From my 11-year old boy's perspective, the day he called to tell us he wasn't coming home, he ceased being my father. But that’s another story. This is one about my hands. When I stretch out my hand, I notice the wrinkles of skin over my knuckles layer and smush together causing a crease to rise at the center of each knuckle, well really just off center. My knuckles recall the topography of the southern Negev with its geological folds and creases. My hands present a turbulent history. The skin over the back of my hands I hardly recognize as my own. It looks old, weathered, aged. It’s not taut and young. Whereas the knuckles’ skin wrinkles only in a horizontal direct, the skin on my hands has wrinkles in every direction. When you pull it there’s little elasticity. The palms of my hands have deep creases fanning outward like a set of river canyons; and tough-skinned callouses still present from the summer’s and fall’s yard work. So I’ve become conscious of all these things in the last several years because in the fall-winter the skin cracks in the corners of the tips of my fingers. It’s the equivalent to having multiple paper cuts. My hands get so dry that the skin at the corners of my fingers crack open sometimes to the point of bleeding. Ouch is right! There’s only really one solution to the problem, and it’s with this that I have a major dilemma. Before I tell you tha,t can I tell you one more thing about hands that comes to my mind? It’s not about my hands but about my son’s hands. That’s one of those things a child says that you don’t ever forget! Back to my dilemma. The best thing for cracked dry hands is a combination of Neosporin ointment with pain relief and Aquaphor. Now the thing about both Neosporin and Aquaphor is that both are super greasy and leave a greasy residue on anything your fingers touch. So, here’s the dilemma: when you have these salves on your painful cracks you can’t use your hands. See the problem. My hands are never idle. Come to think of it, there isn’t a time in the waking hours that my hands are not busy with something. Whether their holding a fountain pen or a pencil, a book or my iPad, or typing on my laptop or scrolling the phone, or holding a steering wheel, my hands are always at work doing something. There’s no time to heal. There’s too much to do. No time for my hands to sit folded in prayer or still to heal. There are tasks to complete; ideas to write; emails to respond to; miles to run; meals to cook; dishes to clean. The only time my hands are idle is the brief - and growing briefer with each year - hours I’m sleeping. My hands tell a true story. They reveal to my consciousness true embodied things about me of which I would have preferred to remain unaware. I’ve learned his lesson perhaps all too well! Resting my hands is not a familiar practice. What story do your hands tell?